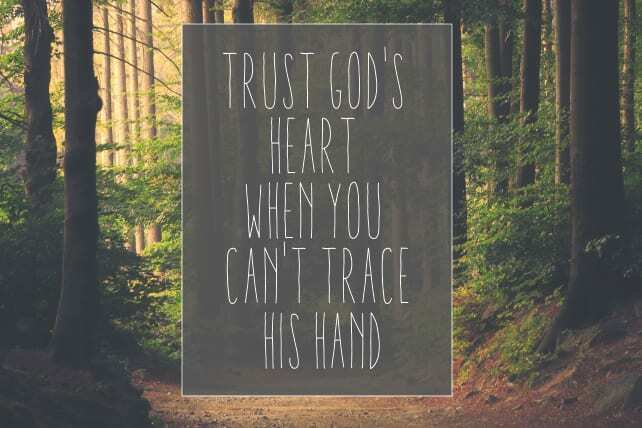 Trust God’s heart when you cannot trace God’s hand. As he suffered, Job complained against God: “Behold, I go forward, but he is not there, and backward, but I do not perceive him; on the left hand when he is working, I do not behold him; he turns to the right hand, but I do not see him” (Job 23:8-9). Job’s complaint was not about his sufferings. His complaint was that he could not seem to find God in his sufferings. Wherever he turned, God was not there. He could not find God. God was not present to comfort, explain or vindicate. Job declared, “But he knows the way that I take” (Job 23:10). Job described his painful experience as a “way,” a path leading to a destination. Job was not in a ditch, or grave. He was on a spiritual journey. His present location was a dark valley, but it was not the final destination. Job was on his way somewhere. His sufferings were a means to an end. God commended Job to Satan as the “real deal,” as it related to his faith in God, obedience to God, and worship of God. To prove Job, God permitted Satan to place Job in a furnace of suffering. But this trial by fire would not last forever. God had his hand on the dial and his eye on the clock. Job’s troubles would not last always. The spiritual examination was designed to purify Job, not destroy him. And when he had been tried, he would come out as gold. You will too, if you maintain confidence in God when you don’t understand what he is doing in your life. Next articleIf We’re So Connected, Then Why Do I Still Feel So Lonely?